Composition book contains 80 sheets of 20 lb. heavyweight paper. Each sheet is unruled. Design features a center-sewn hard cover with square covers. Composition book is ideal for school lab reports. 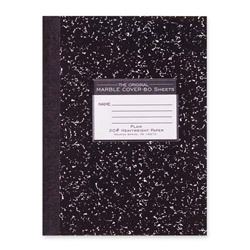 Black Marble Ruled and Subject Notebooks from Roaring Spring Paper! 339 In Stock today.